well here's an article from Bloomberg on that topic which is very interesting indeed. 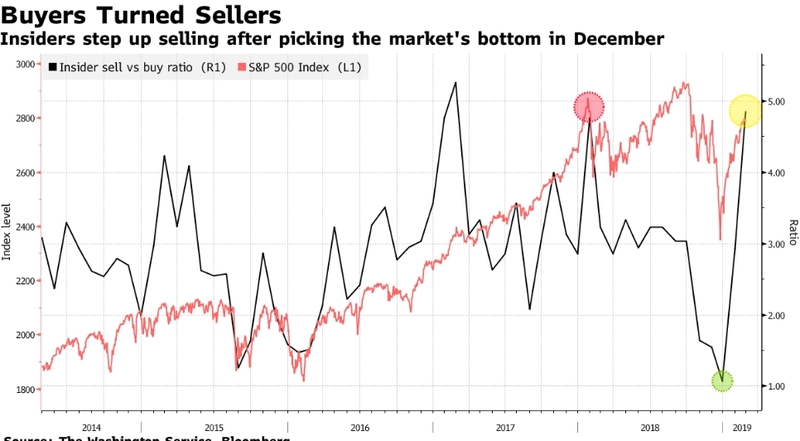 The rats are most definitely jumping ship now, after the most rapid appreciation in stock valuations in years. It would be very interesting to find out if they are selling stock granted as part of year end compensation for 2018. Institute a big stock buyback program to massage the EPS figures,- increasing shareholder value don't you know! Borrow heavily on the back of company to fund said program. Next step, grant yourself a nice bonus using the stock you bought back. sell the stock back into the market again and reap the rewards. In the end, the company is loaded up with debt and the shareholders are left to cover the losses. This is outright fraud in my book! And this is bubble behavior at its best! Enron? Countrywide? Bear sterns? The high of the session today hit 2852.42.
to complete a possible wave 'v' of (v). The nice sharp selloff for the rest of the session hints at a larger turn down in play now. then we should see a reasonable decline for the rest of the week in wave (i) as shown. will be a good sign that the top is in for wave 'B'. And at that point we can expect a nice 700 point drop in wave 'C' to start with. I simply cannot discard them! the probability of these alternate counts will only grow. will be sticking around for the long haul it seems! Watch for this initial selloff to continue in wave (i).